I hear you out there. You’re thinking, “Another stylus review. Whoopee.” But not every stylus is the same; some work better than others. Where does the NuScribe 2-in-1 Touch Screen Stylus and Pen fit in? Let’s take a look. I’ve had an iPod touch for years, followed by an iPhone and iPad, manipulating the screens with my finger(s). One day I decided that I couldn’t stand the smudges, especially on my iPad. It was time for a stylus. I’m so glad my first one was the NuScribe Stylus. There’s no learning curve with a stylus: just touch the nub to the screen as you would with your finger. It took me a moment to realize I needed to add a bit of pressure to the stylus to make it work. After a few short minutes I was hooked: I love the NuScribe Stylus! On one end of the stylus is a soft nub, with just enough give to firmly, yet gently, swipe pages, draw, navigate, and input text. When drawing or writing, the lines were consistent in thickness, and the stylus was comfortable in my hand, just like a regular pen. Tapping on the keyboard was simple; in fact, after just a few hours of using the NuScribe Stylus I had a hard time going back to using my fingers! The opposite side of the NuScribe Stylus is a ball point pen that appears by twisting the barrel of the unit. An attached clip is an added convenience for placing the stylus in a shirt pocket or backpack. 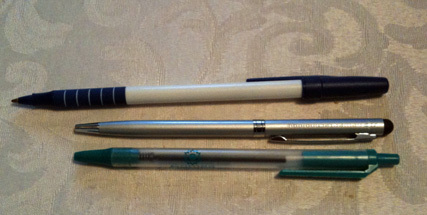 The NuScribe Stylus is a little smaller than a standard ball point pen, but the same size as a click pen. It’s available in silver or pink. 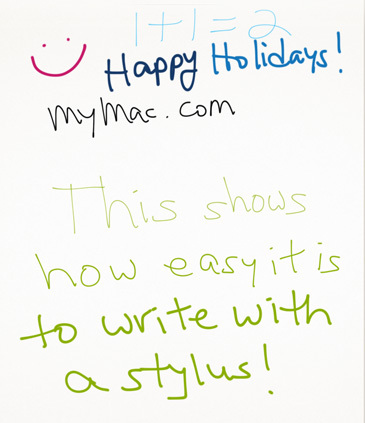 Bottom line: I’m extremely happy using the NuScribe 2-in-1 Touch Screen Stylus and Pen. It keeps my iPad and iPhone relatively smudge-free, and is very easy to use. If you’re in the market for a stylus I highly recommend this product. MyMac.com Review Rating: 9 out of 10.